Exactly. We did our fair share of wikipedia-ing after having been given a jar (along with some other out of the ordinary spices…more on that later). Always up for a challenge, we are setting out to find some tasty ways to use it rather than let it fester in our cupboards. 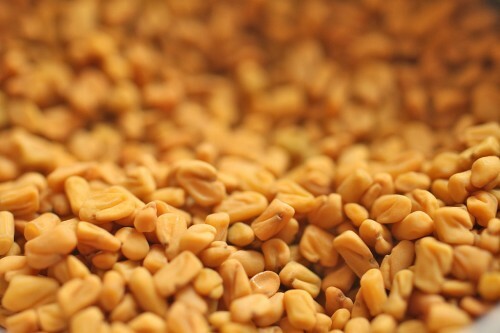 The facts: fenugreek seeds come from an aromatic plant native to Asia and southern Europe. A classic ingredient in Indian curry powders, its distinctive flavor is often described as a combination of pleasant bitterness and delicate sweetness. This entry was posted in Fenugreek. Bookmark the permalink.